An avunculate marriage is any marriage between an uncle/aunt and a niece/nephew. It may refer to a marriage between biological relatives or people related by marriage. In some countries, avunculate marriages are prohibited by law, while in others marriages between biological relatives of this kind are both legal and common. Avunculate marriage was the preferred type of union in some pre-modern societies. This has remained the case amongst, for instance the Awá-Guajá people of the eastern Amazon Basin. Marriages between such close relatives were frequent in Ancient Egypt, at least among members of ruling dynasties. In societies adhering to Jewish or Christian faiths, such marriages were sometimes allowed. The Talmud endorsed marriages between uncles and nieces; although some early Jewish religious communities, such as the Sadducees, believed that such unions were prohibited by the Torah. Amongst medieval and especially early modern Christians, a marriage between a woman and the sibling of a parent was not always interpreted as violating Leviticus 18; this was especially so amongst the royal houses of Europe and, in Catholic countries, a papal dispensation could be obtained to allow such a marriage. Such marriages have traditionally been illegal in Islamic societies and are regarded as prohibited by Islam. Leopold I, Holy Roman Emperor and his niece, Margaret Theresa of Austria (1666). Voltaire (François-Marie Arouet), lived in concubinage with his niece, Marie Louise Mignot Denis. James Mayer de Rothschild, founder of the French branch of the Rothschild banking family, and his niece Betty Salomon von Rothschild (c. 1825). Mongkut and his half-grandniece Somanass Waddhanawathy (1851), and his half-grandniece Debsirindra (1851), and later his half-grandniece Phannarai (1851). Richard von Metternich (son of the famous Austrian Chancellor) and his niece, Pauline von Metternich (1856). 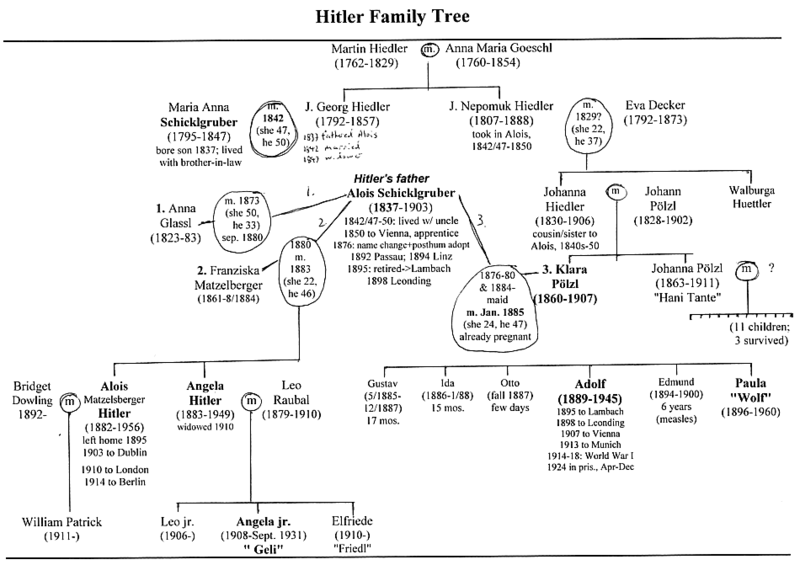 Alois Hitler and his niece Klara Hitler, parents of Adolf Hitler. After they were married, Klara still called her husband "uncle". (1885) Hitler himself declared that his own half-niece Geli Raubal was the only woman he ever loved. Norodom Sihanouk and his half-aunt Sisowath Pongsanmoni (1945), and later his half-aunt Sisowath Monikessan. ^ Sect. 23B of The Marriage Act 1961 of the Parliament of the Commonwealth of Australia as currently in force provides in its (1) that a marriage is in a variety of circumstances null and void, including where […] “(b) the parties are within a prohibited relationship”, this latter defined in the following (2) as being “(a) between a person and an ancestor or descendant of the person; or (b) between a brother and a sister (whether of the whole blood or the half-blood) […]; […] and not otherwise [i. e. not void in any other circumstances; my emphasis].” The section ends with the following note: “"ancestor", in relation to a person, means any person from whom the first-mentioned person is descended including a parent of the first-mentioned person.”. From the foregoing it should now be abundantly clear that avunculate marriage is not prohibited in Australia. The prohibitions quoted from the relevant New Zealand Act in the previous note have their origin in the Anglican Book of Common Prayer, which fact points up one of the main differences between the two Australasian countries. The [Australian] Family Law Act 1975 has not the slightest relevance to the present subject. ^ Pikkanen, Antti (24 July 2014). "Lapsena alttarille – Jenna Karjalainen meni naimisiin alaikäisenä". Nyt.fi. Helsingin Sanomat. Retrieved 26 July 2015. [Oikeusm]inisteriö käsittelee myös muita avioliittoon liittyviä poikkeuslupia. Lupaa voi anoa, jos esimerkiksi haluaa mennä naimisiin sisarensa lapsen kanssa. Mutta sellaisia hakemuksia tulee hyvin harvoin, 2000-luvulla pari kolme. ^ Loretta A. Cormier, Kinship with monkeys: the Guajá foragers of eastern Amazonia, Columbia University Press, 2003, ISBN 978-0-231-12524-6, p. 60. ^ Durant, Will; Ariel Durant (1965). The Age of Voltaire: a History of Civilization in Western Europe from 1715 to 1756, with Special Emphasis on the Conflict between Religion and Philosophy. The Story of Civilization: Part IX. New York: Simon and Schuster. pp. 391–93. ^ * Shirer, William L. (1960). The Rise and Fall of the Third Reich. New York: Simon & Schuster. ISBN 978-0-671-62420-0.